Wellington, FL - January 30, 2011 - The 2011 FTI Winter Equestrian Festival (WEF) concluded its third week of competition on Sunday afternoon with a $25,000 Suncast 1.50m Championship Jumper Series Classic. 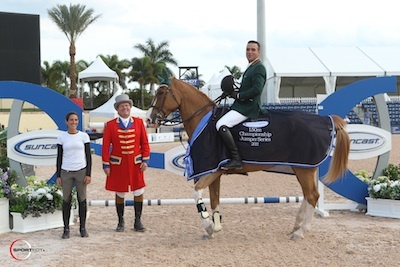 Held in the International Arena of the Palm Beach International Equestrian Center (PBIEC), the class was won by Paulo Santana (BRA) and Taloubet over a starting field of 31 entries. This win was the pair's first WEF victory. This week's course designer in the International Arena was Olaf Petersen Sr. of Germany. Petersen designed a challenging course for the day's class, which narrowed down the field to just six entries who continued to the jump-off. Santana and Taloubet, owned by Jennifer Santana, were the fastest of three double clear rounds to take home top honors. An eleven-year-old KWPN gelding by Baloubet Du Rouet x Quidam De Revel, Taloubet was smooth and confident in the jump-off and earned great praise from his rider. The pair went second over the short course and put down a clear, fast round in 34.537 seconds that would hold up for the win. Nick Skelton (GBR) and Carlo 273, owned by Beverly Widdowson, were fast and clear, but stopped the clock just short of the target time in 34.905 seconds to finish in second place. Ken Berkley (USA) and Ax-Cent, owned by Rivers Edge, jumped clear in 36.508 seconds to finish in third. Skelton and Unique, also owned by Beverly Widdowson, had four faults in 33.931 seconds, placing in fourth. Completing the jump-off, McLain Ward rode Louisburg Farm's Vocas to four faults in 36.284 seconds to place in fifth. Ashlee Bond and Chivas Z, owned by Little Valley Farm, began the jump-off but had an unfortunate fall on course and finished in sixth place. Although today was Santana and Taloubet's first WEF win, they have had success before in the PBIEC's International Arena, also recently winning the $50,000 FEI World Cup Grand Prix, CSI 2* during Equestrian Sport Productions' Holiday & Horses Show this December. "This is his first time showing at the Winter Equestrian Festival, so it could not have been a better start," Santana smiled following this win. "We have had some really good, uphill results. He is getting more focused and maturing and we are getting some consistency. We got Nelson Pessoa to help us with him and he is doing a really good job. He used to be a very inconsistent horse; he would win one time and then have all of the rails down in the next class, but he has been great and today was a happy Sunday." "He is kind of a particular horse; he can have too much power and too much scope," Santana said. "When the options are gaps and wide jumps where you really need to go for it he gets more comfortable. It was not a course where I had to control him too much; I think it was more of a scope test, so it was absolutely his style." Commenting on jumping before riders such as McLain Ward and Nick Skelton, Santana noted, "It was a jump-off of very respectable riders to go up against and I knew that we could not leave any window open for the people that were going after us. They are masters on speed, but when he lands he always chooses the right side to turn, so it happened a lot that I did not have to control him and waste any time doing that. He was great and I am really happy with this win." 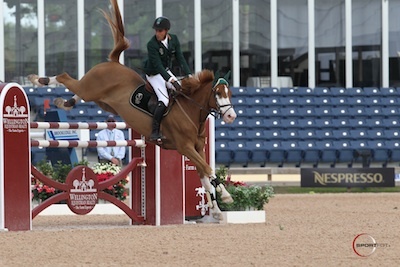 Earlier in the day, Christina Kelly won the $10,000 EquiFit High Junior Jumper Classic with Navarre D'Olueis. They were the fastest double clear to win over Katherine Dinan on Sandro and Reed Kessler with Onisha. This is the second week in a row that Kelly has won the Sunday classic; she also won in week two with Camirage. The 2011 FTI Winter Equestrian Festival will continue with its fourth week of competition beginning on Wednesday, February 2, 2011. Week four, sponsored by Adequan, will feature the $31,000 WEF Challenge Cup Round 4 at 1 p.m. on Thursday afternoon, the $25,000 Suncast 1.50m Championship Jumper Series Classic on Saturday afternoon at 2 p.m., the $55,000 Nespresso Battle of the Sexes at 7 p.m. on Saturday evening, and the $75,000 Adequan CSI 2* Grand Prix at 2 p.m. on Sunday afternoon. The 2011 WEF will continue through April 3, with nine more weeks of top equestrian competition.